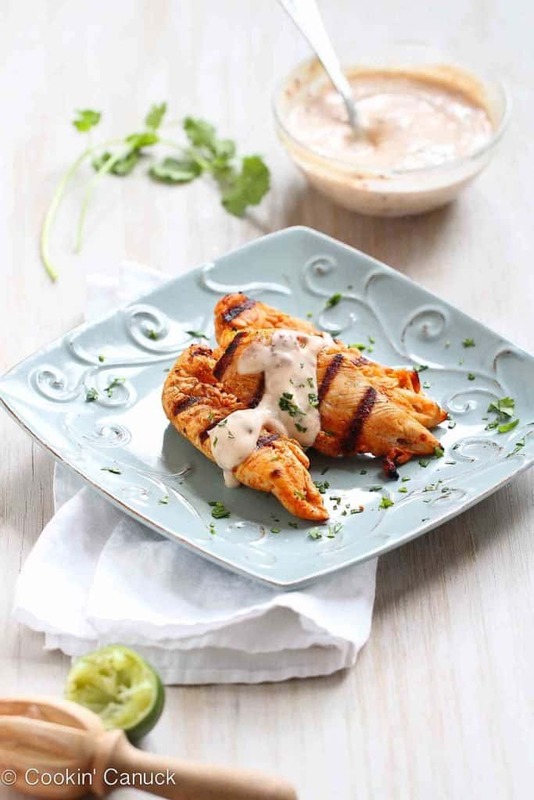 This quick and easy grilled chicken tenders recipe is taken from plain to phenomenal with the addition of an addictive chipotle lime yogurt. 179 calories and 2 Weight Watchers Freestyle SP. Thank you to Green Valley Organics and Redwood Hill Farms for helping me to share this recipe with you. When you start dreaming up entrées just so you can have an excuse to eat a certain sauce, you know you’ve hit the jackpot. 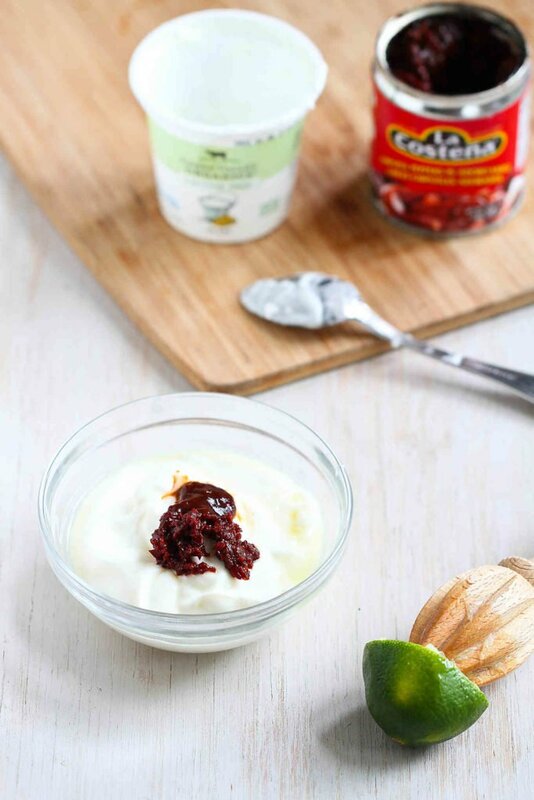 It would seem strange if I just starting spooning this chipotle lime yogurt straight into my mouth, right? That goes right along with my tendency to eat an entire wedge of Brie in one sitting. Maybe those are things that I need to save for my treasured “alone” moments. My husband and I used to buy a fantastic bottled chipotle sauce that we found at our favorite specialty store. We squirted it on everything from eggs to roasted potatoes to sandwich wraps. And then it disappeared from the shelves and we were more upset than any adult should be over a condiment. So, when my friends at Green Valley Organics and Redwood Hill Farms challenged me to make my own yogurt flavor, it was a no-brainer. What if I could whip up a sauce in my own kitchen that rivaled our beloved store-bought chipotle sauce? Well, that would be pretty darn awesome. I set to work with the plain Green Valley Organics yogurt and it didn’t take long to come up with something good…okay, great. I stuck my finger in the bowl for “taste testing” purposes so many times that I needed to stage a personal intervention. It was lunchtime and there were chicken tenders in the fridge, so I mixed the chicken into an easy spice marinade and gave it a turn on the grill. Chicken tenders are fantastic for quick meals before they cook on the grill in 5 minutes or less. If you have never tried Green Valley Organics or Redwood Hill Farms products, head to the nearest Whole Foods Market, or other health food and specialty stores right away. All of the products made by Green Valley Organics are gluten-free and lactose-free, so they are a great option for people with dietary restrictions. In addition, all of the products from Green Valley Organics and the sister farm, Redwood Hill Farms, are free of artificial colors, sweeteners, flavors and preservatives. Knowing that the products are free of those questionable items makes me feel good about feeding them to my family. Not only that, but both the goat and cow dairies used for these products are Certified Humane. That means happy cows and goats. In addition, Green Valley Organics and Redwood Hill Farm are committed to the environment, as evidenced by their commitment to recycling and their use of solar energy. These people do things well. Really well. 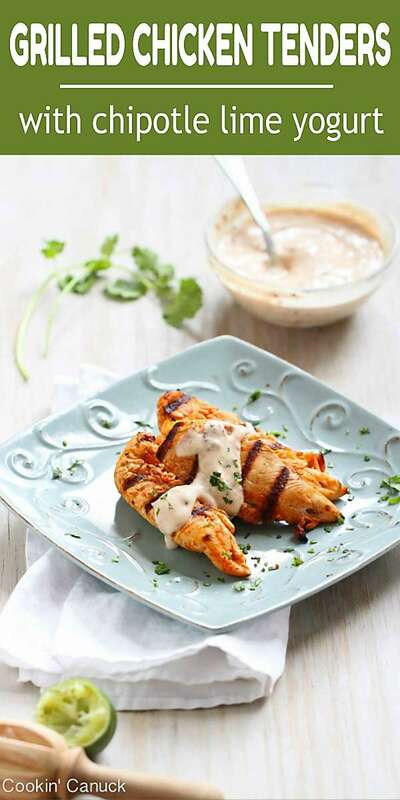 This quick and easy grilled chicken tenders recipe is taken from plain to phenomenal with the addition of an addictive chipotle lime yogurt. 179 calories and 2 Weight Watchers Freestyle SP. In a shallow dish, whisk together the olive oil, lime juice, cumin, smoked paprika, salt and pepper. Add the chicken tenders and turn to coat. Marinate for 15 minutes. 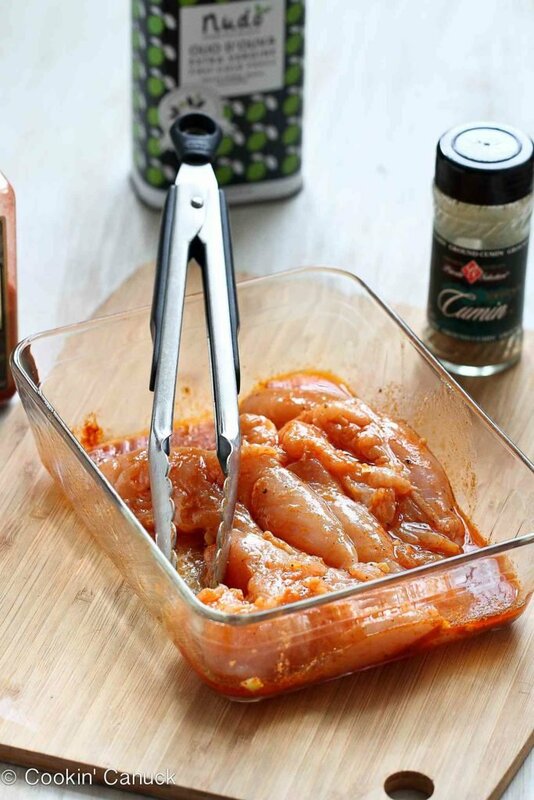 Remove the chicken tenders from the marinade and grill until the chicken is just cooked through, about 2 minutes per side. 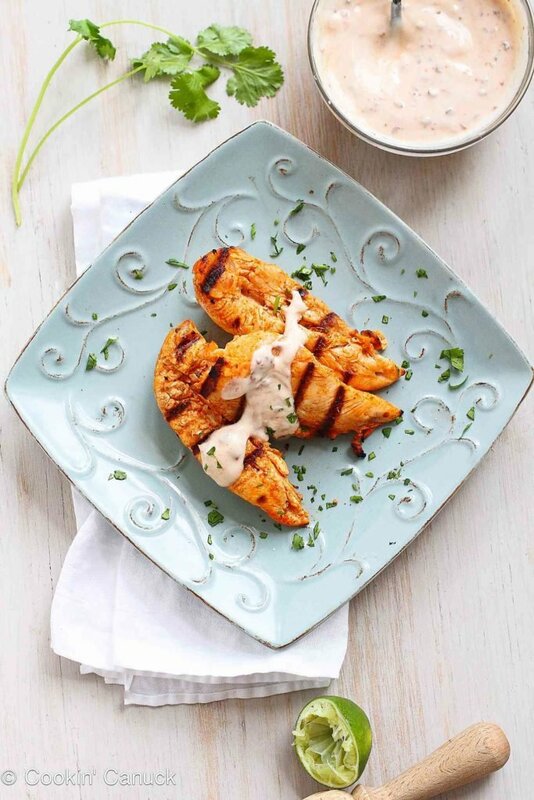 Serve the chicken tenders with the chipotle lime yogurt. Disclosure: This post is sponsored by Green Valley Organics and Redwood Hill Farms. As always, all opinions are my own. I am a participant in the Amazon Services LLC Associates Program, an affiliate advertising program designed to provide a means for me to earn fees by linking to Amazon.com and affiliated sites. 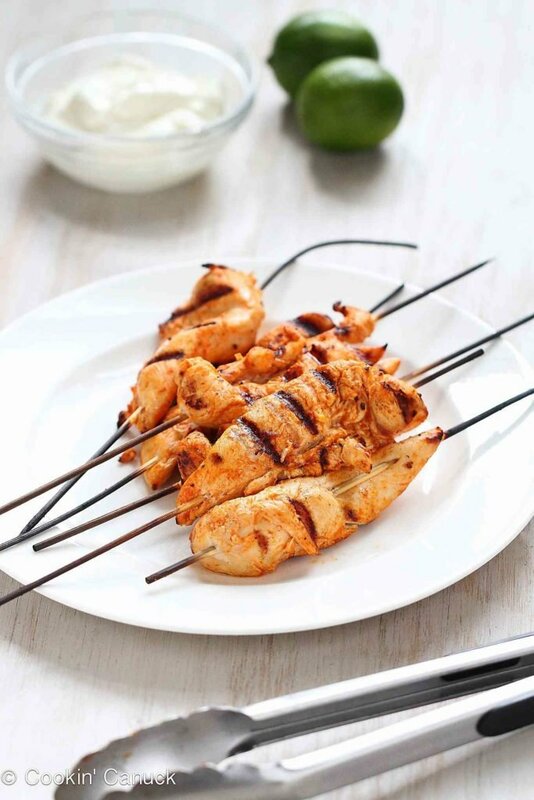 I love spicy food and chipotle is one of those ingredients that add both smokiness and spice, so this sauce must go great with grilled chicken. Perfect for easy summer meals! Thanks, Jeanette. I agree…the smokiness of chipotle peppers really does add something special. This yogurt is something I’ll be adding to many things I cook. Oooooh, I’d take any excuse to make that sauce too. These look great! Thanks, Ali. It’s addictive, for sure! Thanks, Amanda. I always forget how easy chicken tenders are to cook. This is one we’ll be making over and over again. I’m always breading my chicken tenders and apparently I need to keep them as is. The sauce looks great. Thanks, Meagan. Breading can be fantastic too, but be sure to try them grilled. They cook so quickly and have great flavor! Love the look of that chicken + chipotle sauce! Yum! Going to try these soon, for sure. Thanks, Annalise! I hope you have a chance to try them. This looks really good Dara, love that it is pretty healthy too, love the spices you have going on here. Thanks, Cheri. Spices are definitely important when reducing the fat and calories in recipes. I don’t think I could cook without them! Dara, these look the perfect dinner. Nice and light but flavorful too! Thanks for sharing. Thank you, Bri. They make a great meal for a busy weeknight. Thank you. I love that they only take a few minutes to grill, but it’s the yogurt sauce that really takes the whole thing over the top! Your sauce ROCKS! Where is my straw? I don’t think you and your husband have issues. When I merely thought my favorite store bought chipotle dressing was gone, I flipped out. I pinned this JUST for the sauce. YUM!